Will this further eliminate the need for a front derailleur? VYRO components. Discussion in 'Downhill & Freeride' started by Squirrel, Aug 3, 2012. Seems like an interesting concept. What are the your thoughts? Its already been done decades ago in a production bicycle. Radial gears do have the advantage of efficiency over gearboxes but on modern full suspension designs most are optimized around a specified sized chainring which is another important consideration - you would need to add a pulley for the specific ideal chainline to be on par with a gearbox in that respect. Also if the Yankee version was modernized it would be better for mountain biking as there is no second front ring for the chain to fall on in bumpy conditions - so is the only advantage to this version is that you don't have to use the non-traditional shifter design of the Yankee which only works in a limited shift zone of the crank stroke? I've ridden a Yankee years ago and it seems decent - certainly better than another quirky bike I tried with the auto-shifting at a certain RPM. Its already been done decades ago in a production bicycle. Cool link. This looks interesting. Wonder why it never caught on. 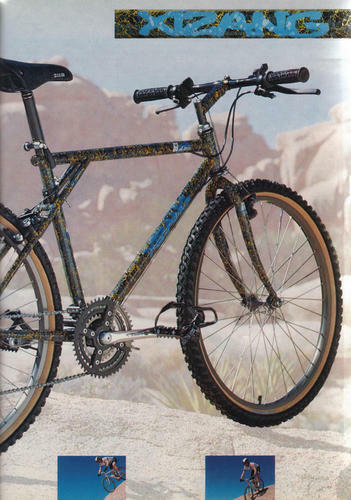 There were so many proprietary designs on that bike its no wonder the company failed. 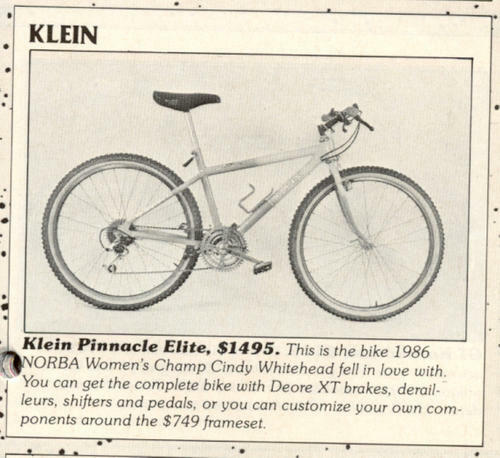 I don't know how they could do it - the bike was $369. I found an accessories catalog for the Yankee in a file cabinet which would put the purchase in 1991. NordicTrack released its Fitness Bike in 1992 featuring the Radial Gear Transmission first created in the 1980s by inventor Royce Husted. Husted introduced his own bicycle -- the Yankee -- shortly before NordicTrack procured the rights to market it under their name. The new gear system never quite caught on and little was heard about it in the ensuing years. NordicTrack declared bankruptcy in 1998 and was subsequently purchased by ICON Health & Fitness. There's a noticeable scarcity of information on the internet about this chapter in the history of bicycle development, so I'm posting this NordicTrack promotional video showing the Radial Gear Transmission and Rim Band Brake in action. For historical purposes only! The OP youtube video at 3:45 he mentions development work on another segmented chainring design more comparable to the Husted 9 speed segmented chainring with the radial transmission with 10 or 11 speeds. A single ring segmented gear transmission would keep the chainline more ideal (for the drivetrain, not suspension) than a dual if the 10-11 speed design they are working on also has the granny ring. That guy in the video seems like a straight shooter. 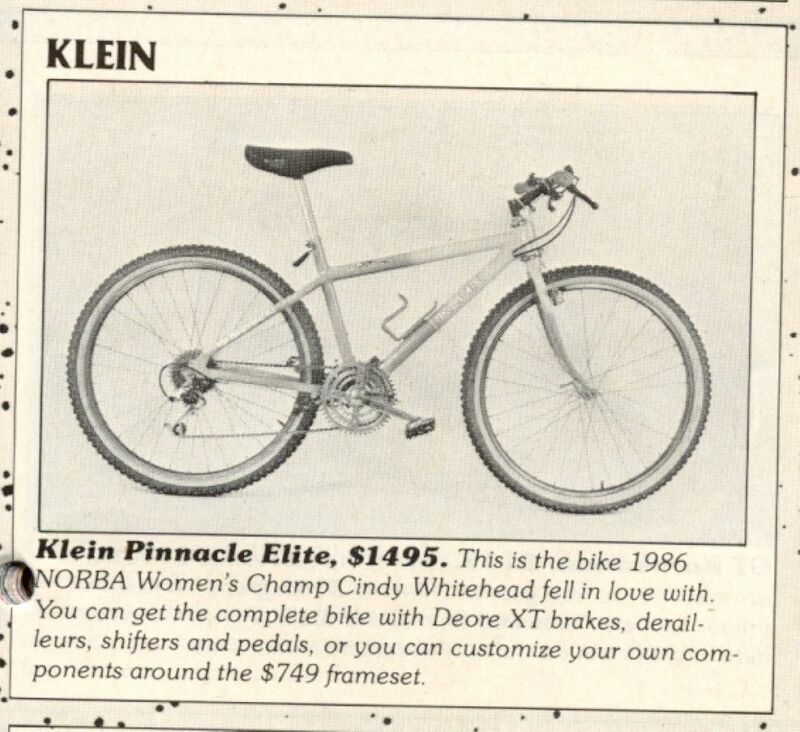 this is bad on a DH bike, but actually really great on a trail bike (or all-marketing term, whatever works for you). Imagine being able to tune your anti-squat with a simple shift! It's easy, it's called a single pivot and the appropriate sized chainring. I think this would be a great idea for an XC trail bike. Going faster, shift up, less AS as your chainring is now in line with the pivot. Going slow, shift down, and now you've got more AS to give more bite as you climb up something steep. I don't know that it could ever replace a rear derailleur, but a six speed rear cluster and ~8 speeds up front with this thing would give you a huge range and perfect cadence everywhere. Wouldn't touch it on a DH bike though, just don't need the complication. It would be more simple to have no rear derailleur/cassette (just a tensioner) and 9-11 speeds up front. Similar to a gearbox DH setup without a rear derailleur. I think its reasonable to assume the front ring could expand and contract enough to provide a spread comparable to a single ring and cassette. Yeah, but you still have a rather large ring subjected to either bash forces or loads of dirt and super high torque. A gearbox, despite its complication, is nice because it's all isolated and often sealed. I've had a similar idea to this for a long time, as I'm sure many armchair bike engineers and inventors have since the creation of geared bicycles. It doesn't actually involve an new tech, as others have shown. But I credit this guy for actually making a working prototype. Part of me wants to sign up to be a "vryoneer" and get a proto. But the proto looks pretty clunky and a bit heavy (as protos usually are). I'd like to see a more elegant solution. That said, I still will want to see the 10 speed version! Stuart Brown agrees. Brown is the West Coast editor for Popular Science magazine, where they received more than 10,000 inquiries on the Yankee after he wrote a brief article on it. ``The bicycle industry in the United States, and even worldwide, has been completely asleep for many years, and why these people failed to adopt his transmission, I don`t understand. None of them saw this as a marketing coup. This is a fundamentally new invention. It`s better than what exists,`` said Brown. Greg Byron, president of the Chicago Area Bicycle Dealers Association, disagrees with Brown. ``The bicycle industry is very responsive and trying to make bicycles more user friendly,`` said Byron, who said he isn`t familiar with the Yankee bicycle. But John Kukoda, senior editor for technical issues at Bicycling magazine, agrees with Brown that the bicycling industry has been ignoring the needs of recreational riders. ``The bike industry is conservative and slow to change. 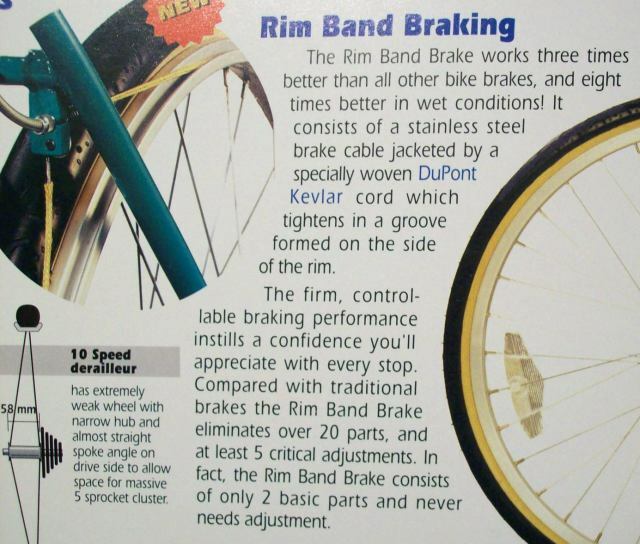 You would think that something like this would be real easy to sell to them, but it`s so outside the norm of what they`re geared up to sell at bike shops that it is probably more trouble than it`s worth to them,`` said Kukoda, who wrote an article on the Yankee bike for a recent issue of Bicycling. Brown further slams the bicycling industry by saying that they suffer from what he calls the NIH (Not In-House) syndrome. I disagree that the industry is slow to change or adopt new tech. If there is something out there that is a genuine improvement, then that will sell bikes, and bike companies will jump on it. Problem is a lot of so called improvements aren't genuine, and require some kind of trade off (i.e. gearboxes). That's true for evolutionary change and this technology emerged before the Internet Age which has greatly added propagation. The niche he was after was not a prime target for the cycling industry. Truly revolutionary technology often fails or fails on the first introduction/iteration. Significant changes in technology (truly innovative/revolutionary products) or ideas always have significant obstacles, switching costs, and other barriers to adoption for a variety of reasons. Changing from a fossil fuel-based (or even a car-based one in the US) society makes complete sense but infrastructure, politics, etc are huge hurdles. Many industries these days purposely design and favor less than ideal solutions or product lifecycles - its not in their interests to make a solution that last forever or obsoletes the norm. You gotta milk your market for all the R&D investment for all you can. Don't forget, the cycling industry is not a first-rate/efficient/professional industry either compared to IT, automotive, appliances, etc. That's true for evolutionary change and this technology emerged before the Internet Age which has greatly added propagation. The niche he was after was not a prime target for the cycling industry. The cycling industry is not a first-rate/efficient/professional industry either compared to IT, automotive, appliances, etc. Changing from a fossil fuel based (or even a car-based one in the US) society makes complete sense but infrastructure, politics, etc are huge hurdles. Many industries these days purposely design and favor less reliable solutions or product lifecycles - its not in their interests to make a solution that last forever or obsoletes the norm. I'd just like to say, from one geek to another, I salute you. In 1990 the Japanese bike component manufacturer SunTour introduced the Browning Electronic AccuShift Transmission (SunTour BEAST) - a triple chainset system for mountain bikes in which one quarter of the circle is hinged along a radius. During shifting, this segment is pushed sideways by a relay operated mechanism like a railroad switch and picks up the chain that is currently running on the next cog. I am Gregor, the inventor and first I would like to thank you for the thread. I read it carefully and needed to register and state some points. It is not a radial transmission system. Nothing is moved radially. The segmented chain rings are moved into the chain line. I do not believe in radial transmission becuase howerver it is solved it is not a round sprocket anymore and it will never be posiible to change gears under load. It has actually nothing to do with the Browning system. The Browning system used the quater segment as a "bridge" to guide the chain from the current sprocket to the dailed one. It would have been impossible to guide the chain or use this system on an Mtb. 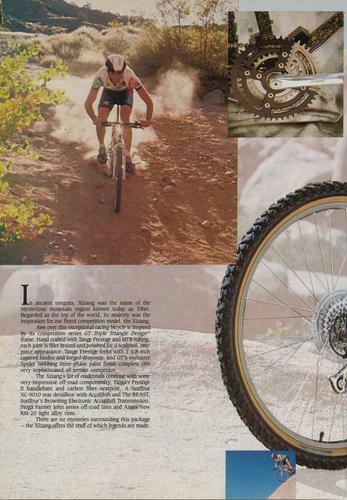 because you cannot pedal backwards - which will happen at full suspension bikes because of the pedal backdraft??? Sorry! My English - i do not know the word therefore. And it took up to a full rotation unless the gear was changed. My system had never ever been produced before and believe me I did a lot of investigations before I decided to invest my money into patents. But please feel free to ask me questions. I really appreciate it. I do not believe in radial transmission becuase howerver it is solved it is not a round sprocket anymore and it will never be posiible to change gears under load. My father owned a Yankee with a radial transmission and I've ridden it numerous times. 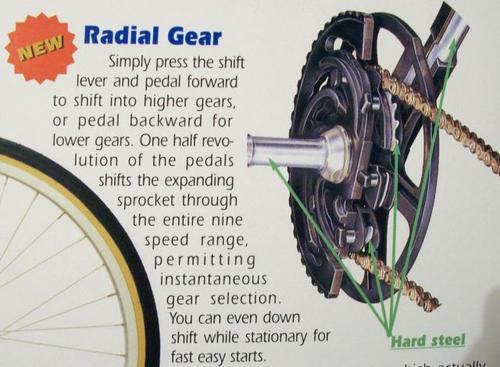 Actually the only way to expand the segmented chainring to a larger gear was to shift while pedaling - it provides the force necessary to expand the radial gear (the load is momentarily used for shifting). Downshifting required you to pedal backward in which case the drivetrain was not loaded and could be accomplished while stopped too. It does not use a conventional shifter but I am certain you could shift down/contract the radial gear under load with a revised design. If you don't like segmented chainring designs than why are you using one? I totally missed out on that one. Looks like a real good idea. Also the announcement of the combined front and rear shifter sounds good to me. Obviously in times of 1x11 this product might stay a niche product, but in places like the alps where you have to deal with steep climbs this system might be a good idea. Especially for desk jockeys like me. Can have adjustment or different sections for people who want oval/biopace simulation maybe? That's definitely where I need an 8lb chainring. The inventor/producer claims to have ridden 12.000 km without any issues or parts giving up. All screws and bolts are made from titanium. The plastic parts shall run for like 9000 shifts and come really cheap when it's time for a change. I must admit that I quite like the idea itself. I'm just no so sure about stability and reliability. Whatever happened to the hammerschmidt? Is that thing still a thing? The cool kids were talking about it a few years ago and with all the 1Xsomething setups people are riding these days you'd think it would be pretty popular.